Custom configuration of test cases can be defined in a standard PHPUnit Configuration file. This allows to specify bootstrap script, timeouts, error handling and other PHPUnit framework options. The Configuration file must be a valid XML file containing <phpunit> root element. To choose active test configuration, go to the Solution Explorer, right click onto a configuration file and choose 'Active PHPUnit Configuration'. Note: Active PHPUnit Configuration setting is stored per user (within Solution User Options (.suo) file). If no configuration file is set, the test runner will try to find a configuration file in the root of your solution directory and then in the root of your projects. The second command in the menu is Open in Configuration Editor. 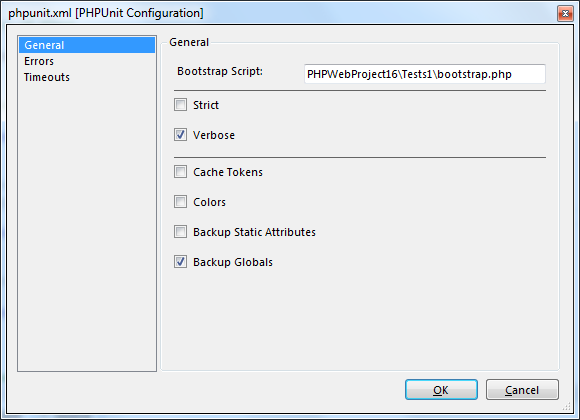 This opens the configuration editor which allows to set various PHPUnit options. See PHPUnit documentation for more information.